The self-help group ESTAS, which is going to visit the UK, consists of seven males with autistic disorder or autistic tendency from the early 20s to the early 30s and a translator. Our organization is being operated with donations of some members without external fund such as other organizations or companies. As a result, financial difficulties often arise when we pursue some activities. Sometimes, we experience difficulties in some activities due to unfavorable prejudices and perceptions of the society against the people with developmental disabilities. Despite such difficulties, ESTAS has been trying to improve the quality of life of the members as well as develop their potentialities. Members regularly attend conferences and publish columns in media. In addition, we ask broadcasting stations to correct false information about autism. We are moving toward a better society constantly planning activities that could not have been done if it were not for ESTAS. We have been actively communicating and debating with people with developmental disabilities, such as autistic disorder, to find answers. 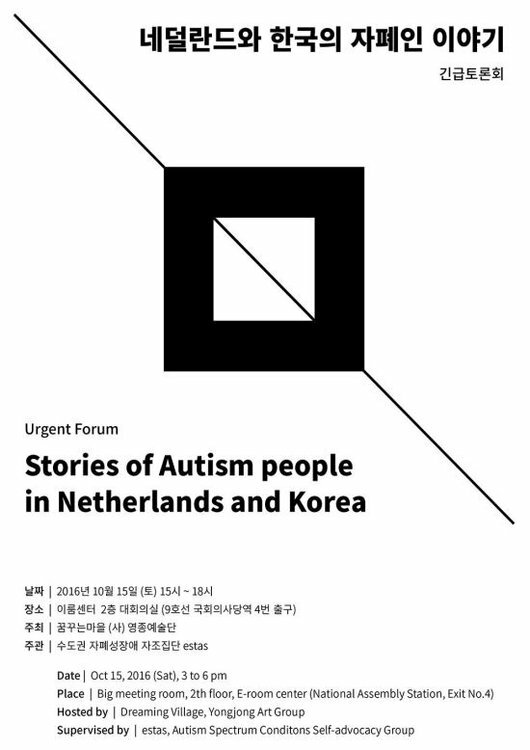 Among them, there are a debate with Birsen Basar who has served as a public relations representative in the Autism Association of the Netherlands since 2014, and a meeting with officers of the People First Korea. Through these experiences, we realized that solidarity with youths around the world, who have the same perception on the issue, is important. At the same time, it became an occasion to think about how to protect socially marginalized people like us and to help change society. We decided to have this expedition to UK to find answers to the questions about solidarity with young people with disabilities and the possibilities of social change. Starting with this visit to UK, we would like to develop a blueprint by building friendship with international organizations in the future.